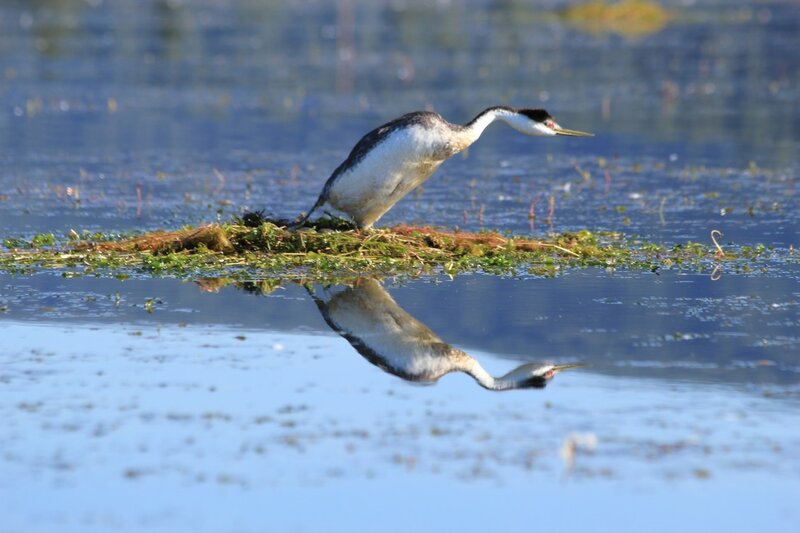 In 2010 Audubon California was awarded a four-year grant to help protect breeding Aechmophorus grebes, (Clark's and Western) at their important breeding lakes in Northern California. Plumas Audubon, along with the Altacal (Chico area) and Redbud (Clear Lake) Audubon chapters have partnered with Audubon California to implement the project, which is currently in its eighth year. Plumas Audubon Society has conducted intensive monitoring at Lake Almanor, Eagle Lake, Antelope Lake, and Lake Davis. 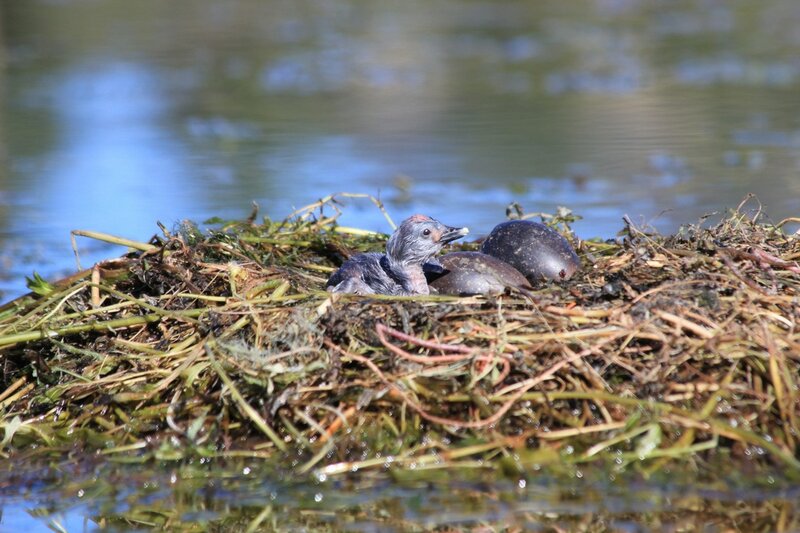 Surveys are conducted at each lake from the time that they begin their nest building in June through late September. The information that we collect on the grebes provides insights into their nesting habitat and reproductive success. 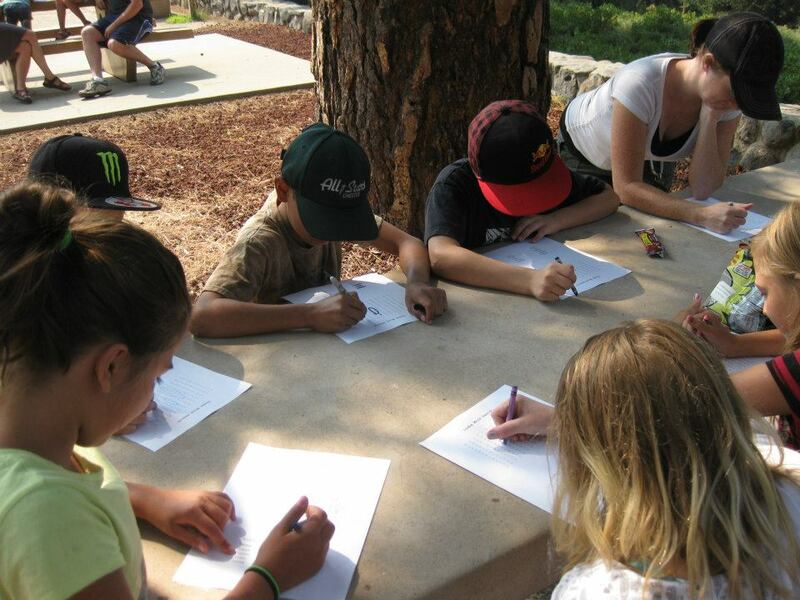 In addition to monitoring on the lakes, Plumas Audubon has conducted diverse outreach and education activities near the lakes. We have installed a variety of signs at strategic locations around the breeding lakes. These signs alert lake users about the grebes and their nesting areas. We have also created and are distributing a tri-fold brochure that is widely available at numerous locations that serve each of the lakes. During this project we have been provided with numerous insights into grebe ecology and nesting habits. 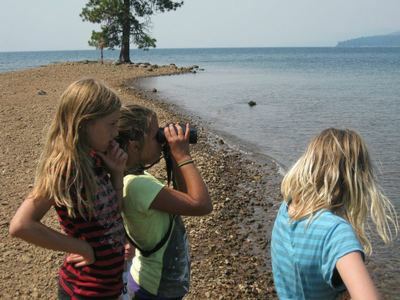 In 2012 The Chips fire provided an interesting change in typical rate of summer draw down at Lake Almanor, providing grebes with longer time periods on nests. 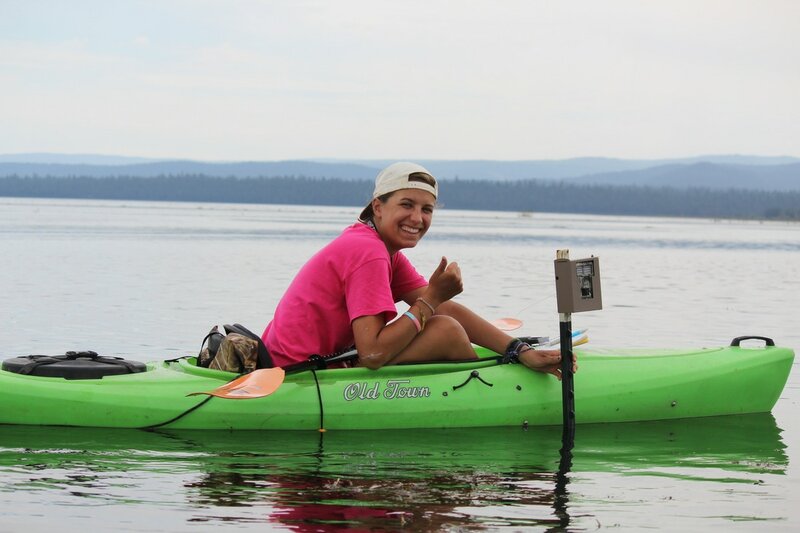 We also observed a new potential predator at Lake Almanor, with river otters (Lontra canadensis) seen in and around grebe colonies. 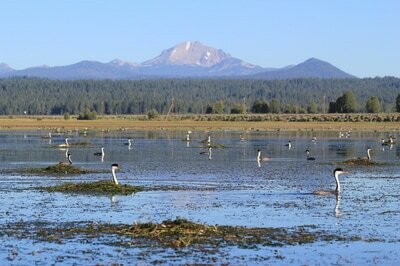 Eagle Lake started with a very low surface elevation, preventing tule patches from being inundated with water. 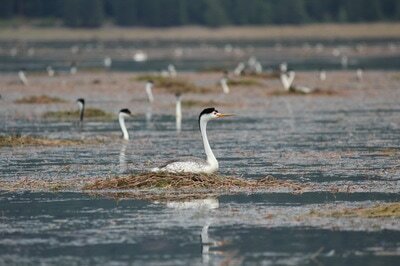 Due to this lack of nesting habitat, no reproduction has occurred on Eagle Lake in 2012 and 2013. 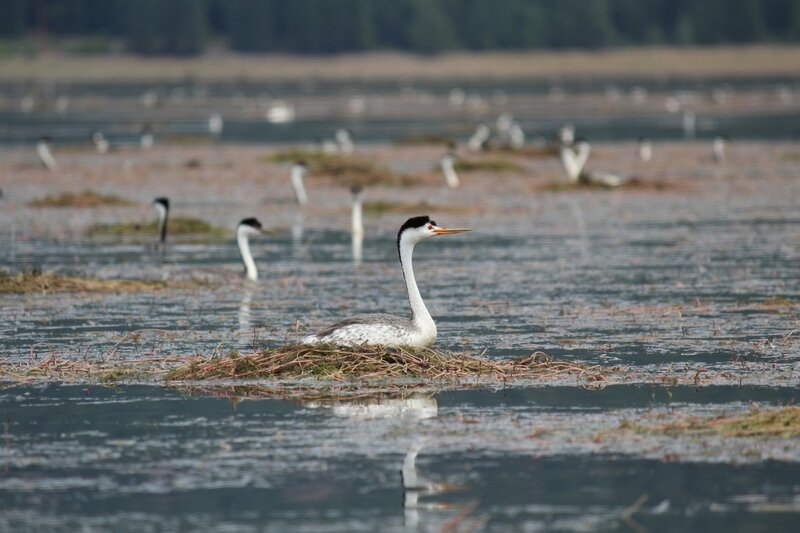 We are finding ways to help conserve these significant breeding populations of Clark's and Western Grebes so that the grebes continue to migrate to our lakes for generations to come. Please contact Plumas Audubon if your are interested in volunteering with this or any of our other bird conservation projects.